This is an excellent 25 minute interview with whom I think is one of the most sophisticated and astute investors. 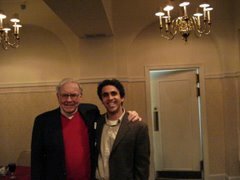 Three years ago, I had the amazing pleasure of hearing Mr. El-Erian speak live in New York City. The theme of his discussion then? Why the global economic shifts would have to lead to a general rise in oil prices. Mr. El-Erian is tops on my list of the most qualified individual to assume the Chief Investment Officer position at Berkshire Hathaway (although as CO-CEO at PIMCO, that may not occur). To view the interview with Charlie Rose, please click here.